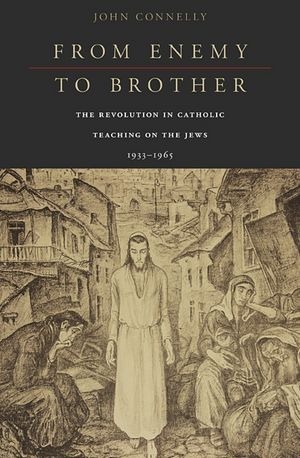 John Connelly (UC Berkeley) has written a focused and important book – From Enemy to Brother: The Revolution in Catholic Teaching on the Jews 1933-1965 (Harvard University Press, 2012). This book addresses the question of how the Catholic Church went from it tradition teaching (that the Jews were cursed by God) to Nostra Aetate, which states that the Jews were loved by God. What could cause such an apparent turn-about in the (unchanging) teachings of the Catholic Church? Why the activists surrounding Johannes Oesterreicher got involved in fighting Nazi racial antisemitism is a question of personal biography that we ultimately cannot answer. yet one fact stands out in their histories: they were converts. This trend did not begin 1933. From the 1840s until 1965, virtually every activist and thinker who worked for Catholic-Jewish reconciliation was not originally Catholic. Most were born Jewish. Without converts the Catholic Church would not have found a new language to speak to the Jews after the Holocaust. As such, the story of Nostra Aetate is an object lesson on the sources but also the limits of solidarity. Christians are called upon to love all humans regardless of national or ethnic background, but when it came to the Jews, it was the Christians whose family members were Jews who keenly felt the contempt contained in traditional Catholic teaching. A group called Maici Israel, which emerged in the 1920s at initiative of Dutch convert Franziska van Leer, demanded an end to liturgical references to Jews as perfidious and a halt to efforts to “convert” the Jews. The story of the change is not merely one of secular and ecclesiastical politics, but it is also a question of the focus of scriptural interpretation. In our day […] Catholics lack guidance on how to relate the teaching of Vatican II to other sources for thinking about the Jews, especially scripture. What about the section in Matthew 28 where Christ enjoins his followers to bring the Gospel to “all nations,” baptizing them in the name of the Father, Son, and Holy Spirit? That does not seem to exclude the Jews, and indeed supports the idea that Catholics should – at the very least – pray that Jews accept Jesus Christ as Messiah. Yet in 1965, despite insistent urging from the personal theologian of Pope Paul VI, the drafters of Nostra Aetate refused to say that the church must conduct a mission to the Jews, or that Jews must turn to Christ. In the statement that the bishops overwhelming accepted and Paul VI promulgated as authoritative church teaching – teaching that cannot be rescinded by later popes – the drafters likewise ignored other sections of scripture suggesting the Jews were responsible for Christ’s death (Acts 3:15) and lived under a curse (Matt. 27:25) and that the covenant God had made with the Jews was obsolete (Heb. 8:13). Instead they shifted the church’s understanding of its relations to the Jews to three chapters of Paul’s letter to the Romans, which contain the Apostle’s most mature reflections on the Jewish people. [The drafters of Nostra Aetate] found themselves drawn to St. Paul because chapters 9 through 11 of his letter to the Romans directly refuted claims made by the racist antisemites. According to Paul, if the question was “race,” then Jews actually stood above “Aryans” (Gentiles) in their predisposition to lead faithful lives. And far from being permanently lost and contaminated – as the racists claimed – the Jews remained “most dear to God” – the very phrase that wen into the Vatican II statement. In fact, St. Paul proclaimed, at the end of time, all Israel would be saved. He had no such certainty about the Gentiles (Aryans). While this book is primarily history (and sharply written, engaging, gripping history at that), this book is far from dead history. Like all history, this book is not about a dead past. The past does not die. Because Catholics fail to appreciate the change that took place in the 1960s, they continue to return to pre-revolutionary patterns of thought without knowing it. The church of our day claims to understand the Jews in the terms provided by Nostra Aetate, but its leaders keep reverting back to the pre-Vatican II period in their pronouncements. In Nostra Aetate, the church was content to think of reconciliation of humankind by God in an indistinct future, with no compulsion for Jews to turn to Christ, yet the pope recently enjoined Catholics to pray for the Jews, “that God our Lord should illuminate their hearts, so that they will recognize Jesus Christ, the Savior of all men.” Even more recently, American bishops asserted that Catholics must look forward to the inclusion of the “whole people of Israel” in the church: something the bishops of Vatican II were careful not to proclaim. This is fascinating history, well-told, and relevant to Judeo-Christian dialogue today. There seems to me quite an irony that it was Jewish converts to Catholicism who demanded that the Catholic Church should stop trying to convert Jews. If these people didn’t believe that Jews needed to be converted, the consistent position for them would have been to renounce their conversion and return to Judaism, not to try to change the position of the Church whose doctrine they claimed to have accepted. I am glad that the present Pope has turned back from this theological error, the supposition that Jews can be saved apart from the Church and so presumably apart from Christ, and restored prayers “that they will recognize Jesus Christ, the Savior of all men” – although I am also pleased that “perfidious” has been removed. Meanwhile, to be pedantic, I would be interested to read “how the Catholic Church reacted to the Holocaust, before …” Should I suppose that it had prophetic insight about the future and reacted to that? Peter, I meant exactly what I wrote. The Holocaust was foreshadowed by a number of signs, including the publication of Mein Kampf, Hitler’s promises to exterminate the Jews, the creation of the Dachau camp (which was not a killing camp), the Nuremberg Laws, and Kristallnacht. The likely end was clear enough to enough people to spur huge emigration from Germany (although it was somewhat blunted by immigration restrictions in many countries.) This spurred considerable discussion within the Catholic Church, which is why Connelly’s history starts in 1933, with the ascension of the Third Reich, and not in 1939. See some additional remarks added 31 May 2012 to the blog here.